The number of Earthlings looking at a potential one-way ticket to Mars has just shrunk by 99.5 percent. 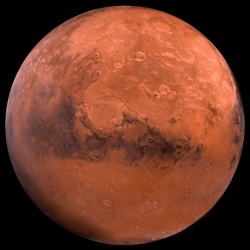 People started applying for a voyage to the red planet in April 2013 through Mars One, a Netherlands-based private venture that wants to land humans there by 2025. By the time the company stopped taking applications, more than 200,000 people had submitted one. Today, Mars One announced that it’s made a short(er) list of 1,058 applicants. 55 percent of the new applicant pool is male and 45 percent is female. That’s more masculine than the general population, but still substantially more gender balanced than U.S. Congress. 63 percent have a bachelor’s degree or higher, while 3 percent of the total hold medical degrees (who wouldn’t want a doctor on Mars?). Less than 7 percent of people on Earth in 2010 had college degrees, which means Mars may soon be the most educated planet in the solar system. 76 percent of applicants are employed, 15 percent are still in school, and 8 percent are unemployed. If surviving as a colonist on another planet counts as a job, expect Mars to have an employment rate of 100 percent. 43 percent of applicants come from the Americas, 27 percent from Europe, 21 percent from Asia, 5 percent from Africa, and 4 percent from Oceania. That hardly jibes with the distribution of the world population; if it did, 60 percent of Martians would be Asian and 14 percent would hail from the Americas. A closer match is the distribution of global wealth by nation, of which the Americas claim 35 percent. 107 countries are represented in the applicants and, at 28 percent of all those accepted into Mars One’s second round, the United States has the largest pool of candidates. 34 percent of potential Martians are younger than 25, about 65 percent are between the ages of 26 and 55, and 2 percent are older than 56. In contrast, 40 percent of Earthlings are less than 25 years old and 17 percent older than 56. The defining moment for Mars One will be selecting its crew (or crews) for a 2025 voyage, but the news does bring a private mission to the red planet one step closer to reality. A bigger step occurred earlier this month, when Mars One announced a contract with Lockheed Martin to craft a design concept for a robotic lander. Its goal: to find and prepare a landing site for the first human visitors to Mars.